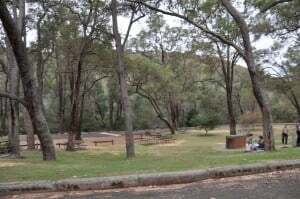 Serpentine is a national park is a great picnic location in the bush near Perth. 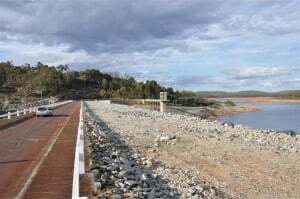 It is home to Serpentine Falls, Serpentine Dam and the Pipehead dam. All 3 areas have the facilities needed for a good day out and you can relax whilst watching the many animals. There are plenty of bushwalking opportunities and if you have a camera you will have a lot of fun! Serpentine National Park is just south of Jarrahdale. 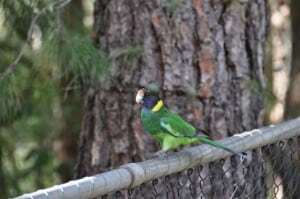 It is about a 50 minute drive from Perth. The actual park is located inside of the South Western Hwy, Jarrahdale road and Kingsbury drive. You can find directions to the national park below. The most common way to get to Serpentine National Park from Perth is to drive down the freeway and get off at Mundijong Road. From there, you turn right onto the South Western Hwy and first left onto Jarrahdale road. 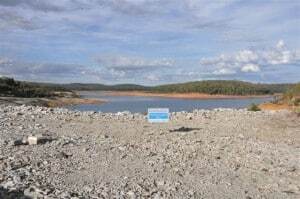 Just after you go through Jarrahdale you can turn off right to go to Pipehead or Serpentine Dam. If you want to go to Serpentine Falls you just follow the South Western Hwy and turn off at Falls Drive. I have put Google Map locations below. 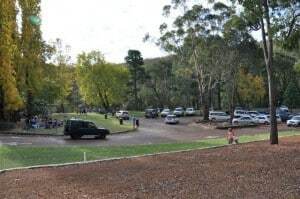 Serpentine Dam has a number of picnic locations, with plenty of parking. You can walk along the main road that goes over the dam, and look either side for photographs. The main picnic areas are set up with toilets, tables and free BBQ’s. The most popular picnic location is the first right after you cross the bridge. This will take you down, passed the toilets and to the bottom where you are overlooking the water flowing out of the dam. 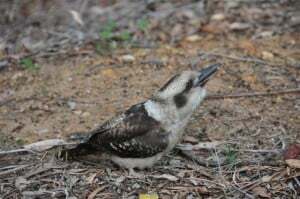 There is plenty of wildlife here, from parrots through to Kookaburras and kangaroos. The birds are very tame, and will often fly down very close to people. There is plenty of room to picnic, and plenty of shade too. I would always suggest bringing your own chairs and tables, or picnic rug. The area is very scenic, and you can easily get some great photos of the birds. There is no charge to visit the dam. To find the exact location of the dam, click here. To get to Serpentine Falls you turn off the South Western Hwy onto Falls road. You can drive into the park and will be asked to fill out a small envelope and pay $11 per car load. You are asked to display the envelope clearly under your windscreen, or you can expect a fine from the ranger (who regularly patrols the area). Personally, I don’t like the fact that you have to pay money to enter the area, but it is well worth it. You can park around a grassed area, or drive over a small bridge and park closer to the falls. 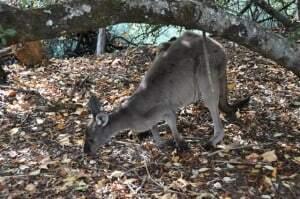 The grassed area has a huge number of Kangaroos walking around (they are very tame) and plenty of other wildlife. It is about a 500 metre walk to the falls, which are well worth a look. Swimming is not advised, although everyone does it. The rocks can be very slippery when wet, so you need to be careful if you are going to swim. I would suggest climbing the rocks is a bad idea – there have been more than a few people that have died from slipping off them. If you are going to swim, just take it easy and enjoy the water! Again, there are tables and BBQ’s provided, along with toilets. You can walk around the area on a few different trails; there is quite a bit to see. I would suggest the falls are more picturesque than the dam, but they are both worth going to. Please ensure that you leave the area by 4:45pm to avoid being locked in by the ranger! The gates are locked at around 4:50pm and you are stuck inside if you haven’t gotten out by then. 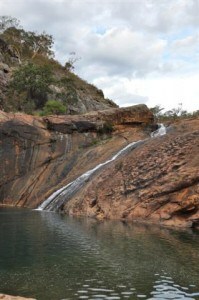 To find the exact location of Serpentine Falls, click here. The Serpentine Pipehead Dam also has a beautiful picnic area. I have never been to the dam, but I am told it is worth a visit. There are the standard facilities available too. The exact location can be found here. Pets and fires are not permitted in the National Park. Please take your rubbish away with you (or put it in the designated bins) and don’t feed the animals, as they learn to depend on unnatural food. Serpentine National Park is a great place to spend a lazy afternoon with friends and family. In many ways it is similar to Araluen (although in some ways even more spectacular). I hope you enjoy your visits there.